When paratroops are dropped behind enemy lines they are very vulnerable. They do not carry heavy weapons to deal with armoured vehicles, gun emplacements or enemy machine gun strong points. They need the support of a tank but most WW2 tanks were too heavy to be flown to the battlefield, dropped by parachute or landed by glider. 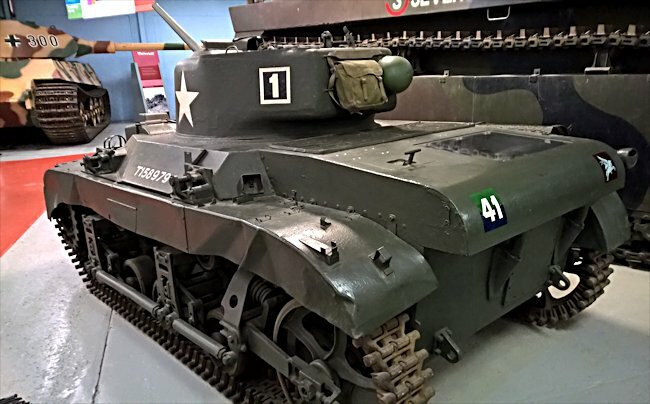 The M22 Locust was designed as an armoured airbourne infantry support tank. It was not a standard light tank that had been adapted for airbourne duties like the Tetrarch MkVII light tank. As early as 1941 the British Government requested the construction of an airmobile light tank under the American Lend-Lease program. The design submitted by the Marmon-Herrington Company Inc was chosen. Only 830 tanks were produced between 1942 and 1945. 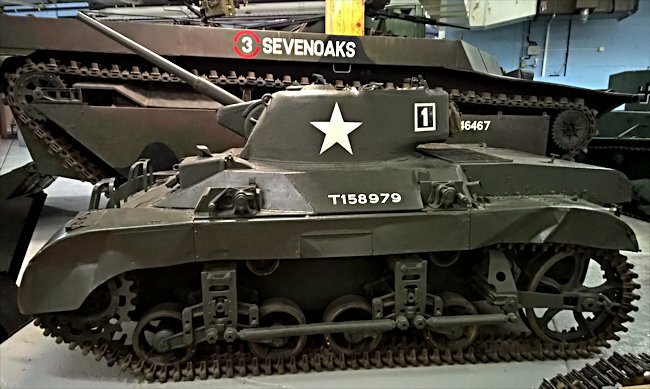 The Locust M22 only weighed 7.4 tonnes (16,400lbs). It had a crew of three: commander/loader, driver and gunner. Its armed with a 37mm M6 gun and could carry 50 rounds. At the time it first saw action this gun was obsolete. It would have been incapable of penetrating the front armour of any of the German tanks and Self Propelled Guns used in 1944-45. It could fire small high explosive HE shells against soft skinned vehicles, gun emplacements and enemy strong points. 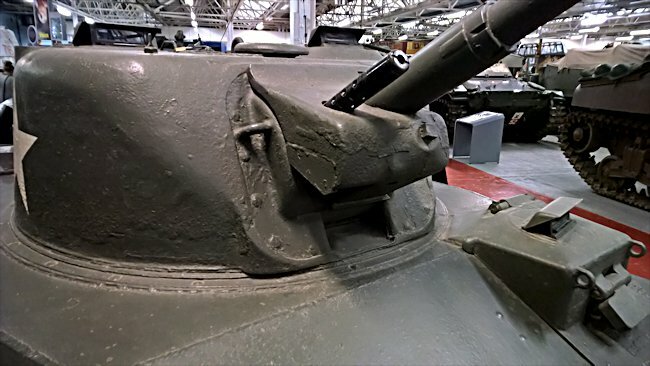 Its armour was thin because of the problem of keeping the weight of the vehicle down, ranging from 9.7 mm to 25 mm, but the front hull plating was very well sloped which would help deflect any incoming shells. The crew would be safe from small arms fire and nearby exploding artillery shell shrapnel but not German armour piercing shells and very heavy .50 caliber machine guns. It had a secondary armament, coaxial 30-06 Browning M1919A4 machine gun. Its top road speed was 40 mph (64 km/h) and a range of 135 miles (217 km). On the 24th March 1945 eight M22 Locust tanks were loaded into eight Hamilcar Gliders. They were towed by Handley Page Halifax Bombers behind enemy lines in Germany to assist paratroops from the 6th Airbourne Division in Operation Varsity. The aim of the operation was to capture the strategically important village of Hamminkeln and a number of bridges over the River Ijssel, as well as the southern portion of the Diersfordter Wald forest. All the eight gliders managed to arrive near the landing zone despite having been subject to German anti-aircraft fire during the journey. Then disaster hit. One of the Hamilcar Gliders suffered structural failure in mid-air as it started to descend resulting in the crew and tank plummeting to the ground. Three of the other gliders were hit again by anti-aircraft fire as they tried to land causing them to crash. Two of the tanks they carried were drivable. One had a damage radio and an unusable 37 mm main gun. The other Locust found it could not fire its machine gun because of damage caused during the rough landing. The third tank was rendered useless after it was flipped onto its turret. The paratroopers now only had six light tanks available to them. Then disaster hit again. Only four of these remaining six tanks would make it to the operational start line for the main attack. One Locust tank was destroyed by a German self propelled gun shell as it tried to help some American paratroopers who were coming under hostile fire. Another tank broke down near the landing zone as it tried to tow a jeep out of the wreck of a glider. It was decided to send the two serviceable tanks to the high ground east of the forest. The two damaged tanks would provide covering fire as best they could. The paratroopers and the tanks came under small arms fire. The German infantry, having spotted the tanks, used their radio to called for artillery strikes and anti-tank gun support. After several hours of combat and many casualties the Allies withdrew to a new location where they repelled a number of German counter attacks until they were relieved by the arrival of a tank squadron from the 44th Royal Tank Regiment and units from the 6th Airbourne Armoured Reconnaissance Regiment. Where can I find other preserved M22 Locust Light Tanks? Roberts Armory World War II Museum in Rochell, IL USA.